Ledgeview Partners to Create Dynamic Opportunities for the User Group Community – Join Us at CRMUG Summit Phoenix! This fall, step away from your screens, pack up your big ideas, and head to CRMUG Summit Phoenix, the most comprehensive and impressive conference of the year. As a proud Partner Member, Ledgeview Partners is excited to share this experience with you as we squeeze every last bit of functionality out of the products and get you the ROI you want—and deserve. 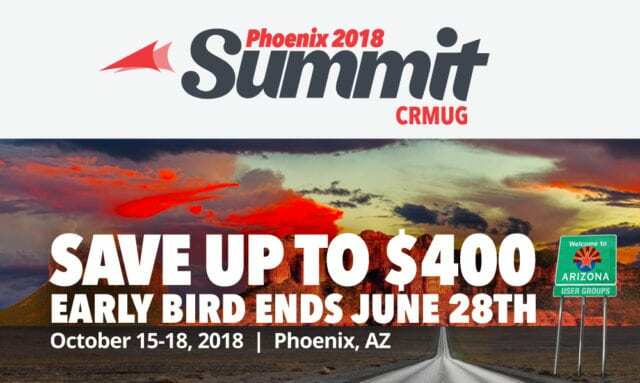 As the early bird deadline for registration approaches, we urge you to sign up for the CRMUG Summit by June 28 to save up to $400 on your tickets! Don’t miss out on these BIG cost-savings. CRMUG Summit is THE go-to conference that brings industry experts, software development vendors, and everyday users together to discuss important issues, trends, product updates, customer pain points, and genuine solutions. Geek out over great content: There’s no better way to learn than peer-to-peer with other Microsoft Dynamics 365 for Customer Engagement or legacy Dynamics CRM users. Share and learn broadly across a variety of content tracks that feature role-based learning, specialty topics, or application-focused solutions across Microsoft Dynamics 365 for Customer Engagement, legacy Dynamics CRM, and other complementary Microsoft technologies. Meet & network with your user group buddies: CRMUG Summit provides countless opportunities to create lasting relationships by connecting and networking with your Dynamics peers. Learn from your seriously smart peers: Learn from and connect with Dynamics 365 for Customer Engagement and Dynamics CRM experts and Business Solution MVPs on a personal basis. Ledgeview will be speaking at the event, so be sure to sign up for our educational sessions, and say hello. As a CRMUG Summit Sponsor, Ledgeview will have a booth at the conference where several Ledgeview Partners team members will be available to connect with you, whether it’s engaging about what’s possible in Microsoft Dynamics 365/CRM, talking best practices to overcome your sales, marketing, or customer service challenges, or just discussing all the amazing things to do in Phoenix while you are there! We look forward to connecting with you and sharing insight on a variety of valuable topics that will provide key takeaways you can use at your company soon after the event. Save an additional 10% off your CRMUG Summit registration when you use the following coupon code, exclusive to our customers: PRPLedgeview. So grab your PC, sunglasses and business cards and join Ledgeview Partners in Phoenix: Register now. If you have more questions about the summit, please feel free to reach out to Chad Collett, Director of Marketing at Ledgeview Partners. We would be happy to provide any clarifications you may need!